Get ready to swipe and tap your way towards a successful career in Inbox / Outbox Management! 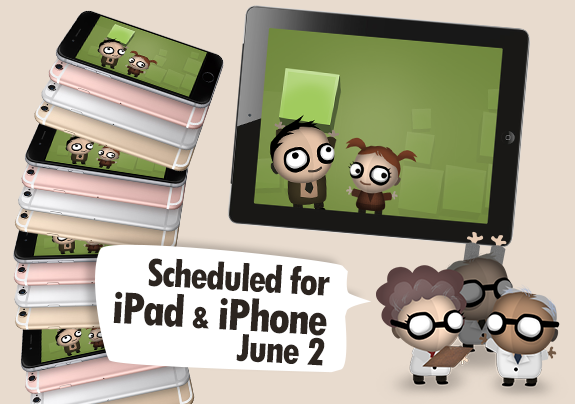 Human Resource Machine will be available for iPads and iPhones THIS WEEK, Thursday June 2! It will be available as a Universal App (which means a single purchase works on your iPads and iPhones), and will work with iPhone 4s and higher, and iPad 2 and higher. Management looks forward to your promising and user-friendly employment. The menu buttons all require pressing about 1 cm to the left of where it is illustrated. Kind of a game breaker as it means guessing where to press to do anything. Hopefully a fix is coming? Thanks for letting us know. We’re looking into the issue! Yep, fix should be out tonight. Does not work on iPhone 6 Plus S. Can’t see half the screen and clicking is off. Did this even get tested? These are obvious bugs. We’ve already got a fix and the update will roll out tonight. (The game released a day early, so you will still have a perfect build on the real release day!) Happy programming! I love it. But needs iCloud save sync between devices please. I’m really enjoying this new game! It’s fun simply completing the level and then trying to complete the optimization challenges. I was wondering if you were planning on adding iCloud sync so that our progress is synced across devices (so we wouldn’t need to complete levels once on our iPad and those same levels again on our iPhone). It would be nice to pick up where we left off when switching to a different device. Also, have you considered abbreviating the name of the app so that the app name doesn’t appear as “Human Res…” but rather something like “HRM”? Thanks again for the consideration and looking forward to future updates! I just noticed this post. And I see that others have already asked for iCloud sync so I’ll just wait for an update while keeping my fingers crossed. Hi, I really love the game and as someone who’s looking to learn game development would it be possible to find out what framework your developers primarily use for their game dev and asset creation. I have the iPad version. The Mod Module #24 has an error. When the divisor is larger than the dividend the game wants me to pass the dividend to the outbox. That should never be the remainder so I don’t know what you’re looking for. Love the game, I’ve told a lot of people about it. We get lots of questions wondering if there’s a bug in a specific level, so we’ve put together a handy FAQ – just scroll down to the question all the way at the bottom “Help there’s a bug in Level 21! Or Level 20! Or some other level!”. HRM is the best app for teaching programming that I have come across. I am using it in homeschooling my son. (I invented a simple teaching language called Flow in 1970.) I would like to see a few features added to it to make it more useful and clear for a learning environment. Is it possible to get access to the project to make these extensions or are you interested in making them yourselves? Please let me know the best way to discuss this. Thanks! I’m glad HRM is useful for education! It’s not an open source project, but others have made HRM emulators etc. iPad and iPhone are great for all, so for that, I have some different tricks, so if you interested with it then I have some different tricks, for further about it which site I give with the name by viewing it you will be very helpful to know about it.